Pick-up is available for hotels located in Cancun and Riviera Maya from Monday to Saturday from 3:30 pm y 4:30 pm. Your pick-up schedule will be sent by email after booking. In case we don’t have pick-up service for a specific hotel or location, you will be asked to meet us at the nearest meeting point available. SKU: xplor-fuego-1. Categories: Tour Packages. 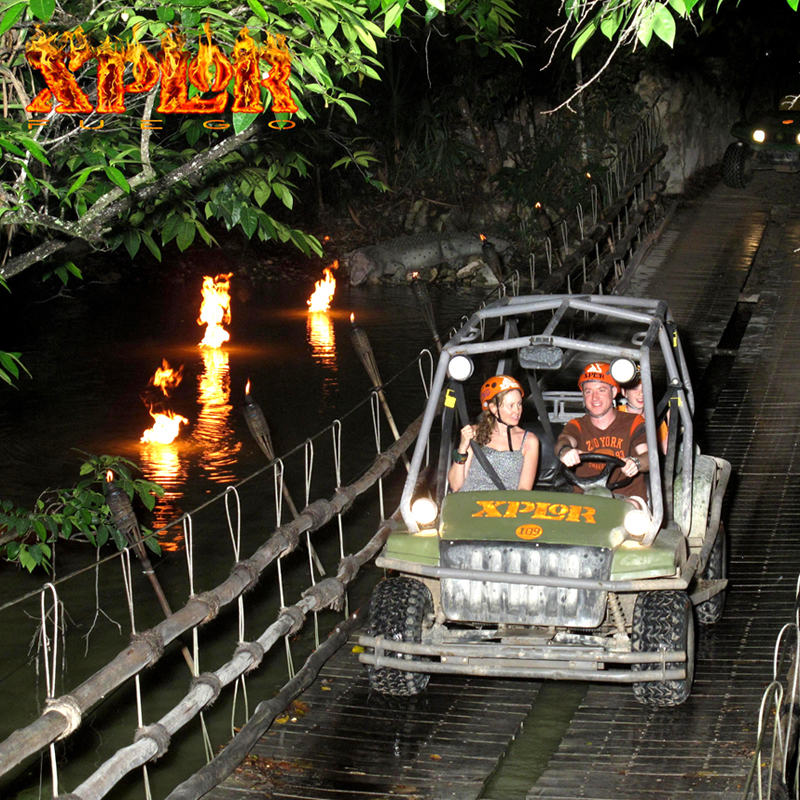 This is the only Expedition that offers our visitors an amazing adventure in the darkness of the Mayan Jungle where the Night will fall over the wonder of nature, Xplor Fuego; is a challenge in the darkness, something that you have never imagined. 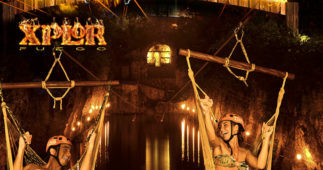 Live the intensity of the night gliding along these amazing Zip Lines, riding amphibious vehicles with routes that run among the jungle and into caverns, and go underground to the rivers where you can swim or paddle through. 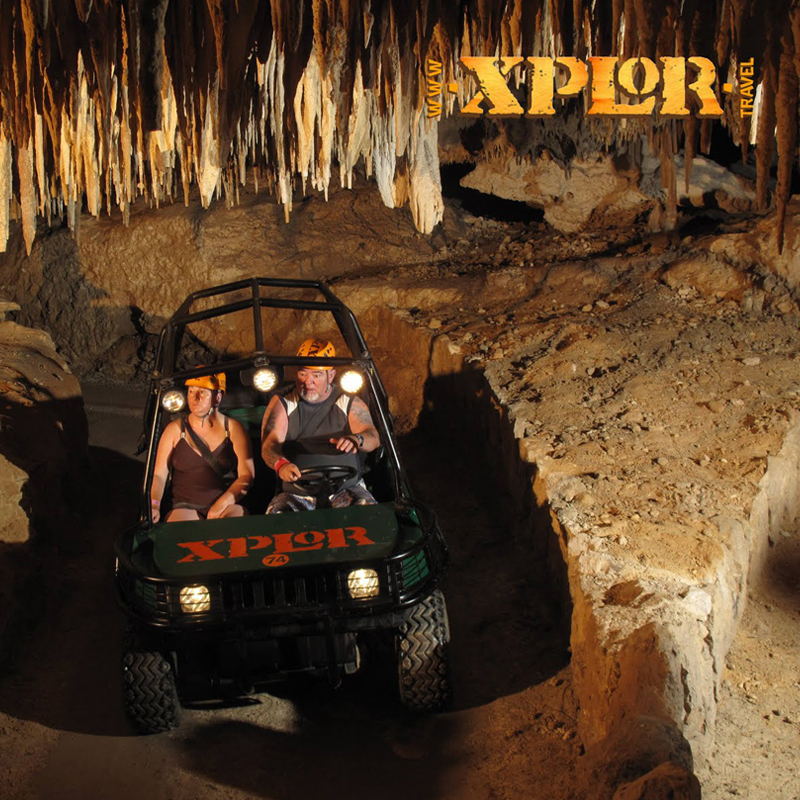 Your adventure begins with pick up at your hotel in either The Riviera Maya or Cancun. Once you arrive at the park you will be guided to the check in area, for your park instructions, once you are inside the park you can start your activities for the evening. Zip lines: Flight among the Stars! You can always start your activities with the 9 zip-line circuit. Rafts: Experience the Darkness! 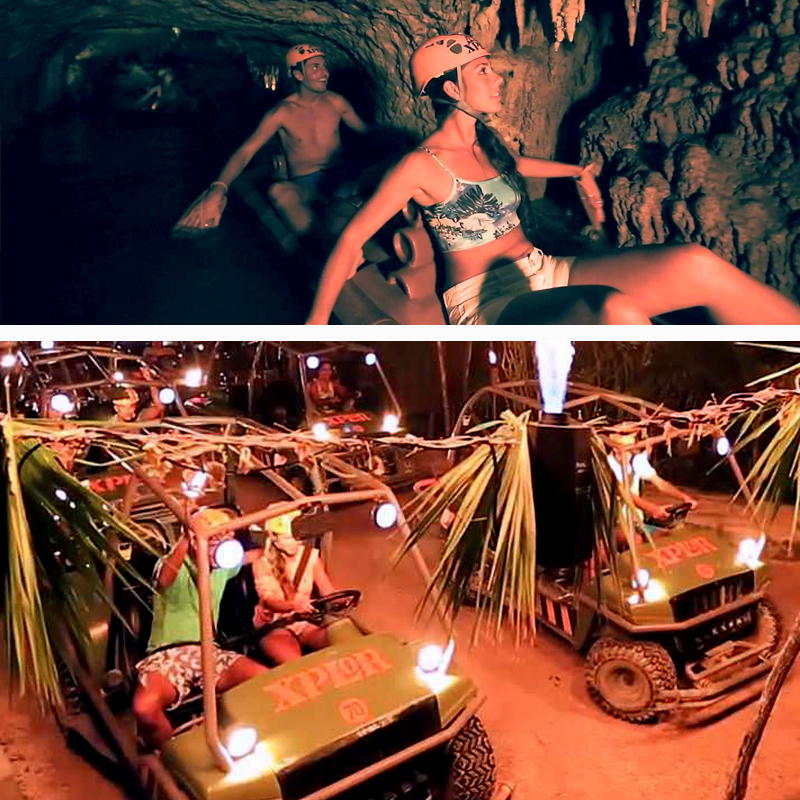 Paddle a Raft 580 yards through underground caves. 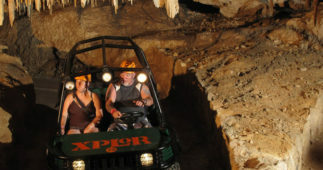 Drive your Amphibious Vehicles: ride among the jungles and caves in our amphibious Vehicles in a 3.4 mile circuit. 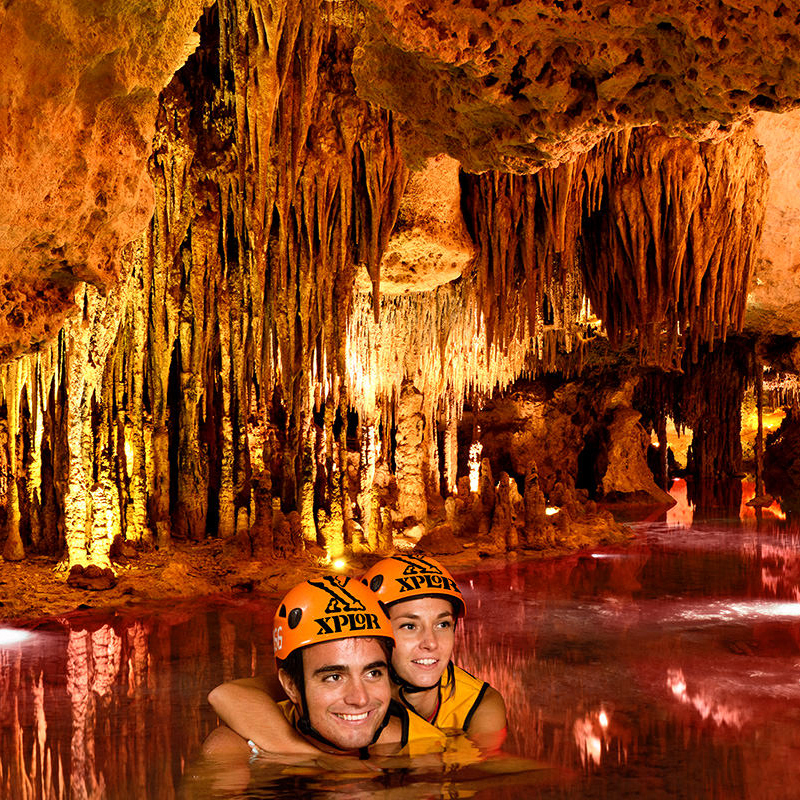 At the Stalactite River Swim you will also be able to swim along 430 yards of crystal-clear waters. Our friendly staff will provide you with all the required equipment needed. For the Zip-Lines: helmet and harness, Rafts: helmet and paddles, Stalactite River Swim: helmet and life jacket, and and give a safety briefing during all the activities. 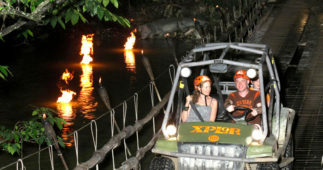 Besides all the fun that you will experience at Xplor Fuego you can also enjoy our delicious buffet dinner, with natural flavored water and beverages such as hot coffee, hot chocolate as well as cookies during the evening, these will give you the energy you will need to have the most exciting night of a lifetime. 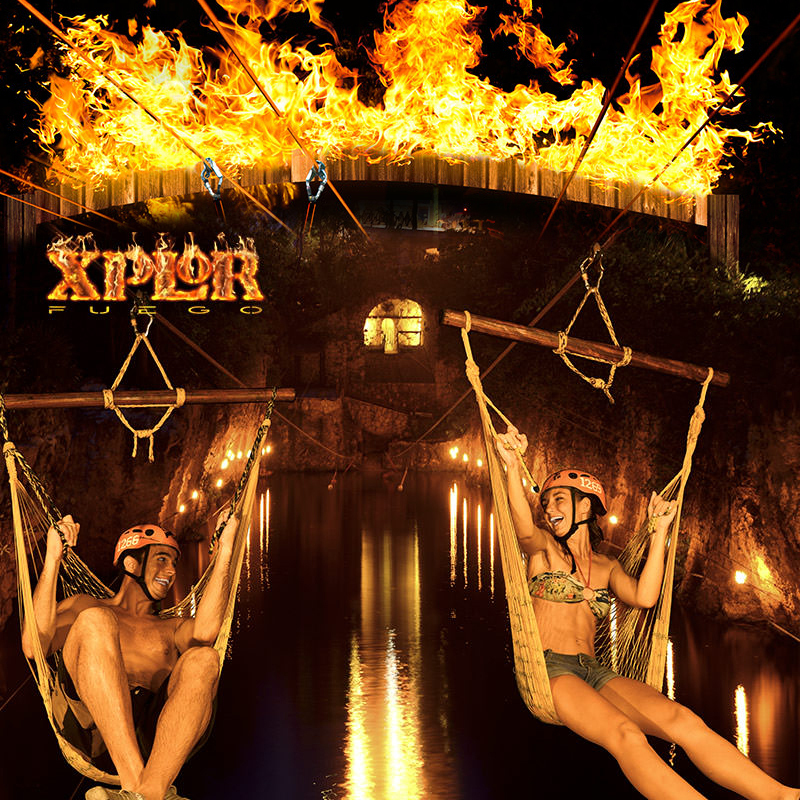 If you have been to Xplor Mexico already, this is your chance to experience Xplor Fuego at night and you will find out that this is one of the most exiting adventure tours in Cancun and The Riviera Maya. 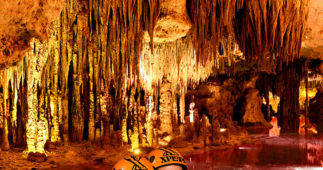 Tuesday and Friday from 5:30 to 11:30 p.m.
580 yards of underground caves to paddle on a Raft. Swimming along 430 yards of crystal-clear water in the Stalactite River Swim. Buffet and unlimited beverages (coffee, hot chocolate and multi-flavor water). Equipment (life jacket, helmet, harness, paddles, raft, amphibian vehicle for two). About Zip-Lines: To ensure your protection and make sure the harnesses are comfortable and fit properly, a minimum weight of 40 kg (88 pounds) is required and a maximum weight of 136 kg (300 pounds) is allowed. The capacity in the harness circumference around the waist is 51 inches and 27 inches around each leg. The minimum height required for this activity is 1.40 mt. Amphibious vehicles:Only people over 18 years can drive the vehicles. It is essential that you present a valid ID proving your age. This expedition is restricted to pregnant women, people with heart problems, diabetes, epilepsy, asthma, hypertension and claustrophobia. Children must be at least 7 to enter the Park. Children between 7 and11 years of age will pay50% off adult ticket price. Must show official ID at the Park´s ticket office. Pick-up is available for hotels located in Cancun and Riviera Maya from Monday to Saturday from 3:30 pm y 4:30 pm. Your pick-up schedule will be sent by email after booking. In case we don’t have pick-up service for a specific hotel or location, you will be asked to meet us at the nearest meeting point available. Water shoes, bathing suit and towel. Wear comfortable clothing (Shorts and T-shirt).